Abstract: The construction of teaching materials of scientific physical education research methods in China has gone through three stages, namely, preliminary stage, mature stage and development stage. New characteristics shown in fundamental scientific methodology have provided the construction of scientific physical education re-search methodological system with directional guidance; substantial research methods have caught the attention of researchers; in scientific physical education research, we should pay attention to the rationality of research methods. 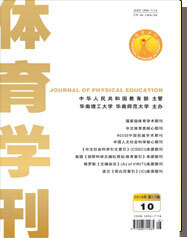 The author also put forward that in the compilation of teaching materials of scientific physical education researches methods, we should comprehensively implement education and physical education guidelines of China, and the es-sence of Regular Physical Education Curriculum Plan for Common Institutes of Higher Learning in China and Ma-jor Regular Physical Education Course Teaching Guide for Common Institutes of Higher Learning issued by Minis-try of Education, embody such compilation ideas as high starting point, new content and valued practical applica-tion, and follow the principle of equally valued compilation and selection, supporting student’s independent learn-ing, highlighted systematical arrangement and key contents, and unifying knowledge lecturing with capability culti-vation and cultural education. Structurally new teaching materials are mainly composed of three major parts, namely, methodology, research method and specific method.